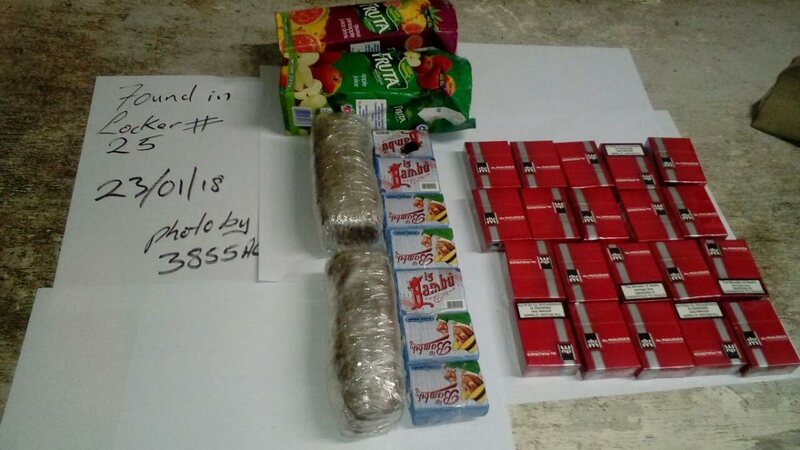 This photo shows the marijuana and other contrabrand items found in a prison officer’s locker at the Port of Spain prison. The officer who was assigned this locker, sources said, has over 15 years service but was not on duty at the time of the joint police/prison search. On Tuesday, after receiving certain information, police and prison officers locked down the prison and conducted a cell to cell search. Ten prisoners are said to have resisted having their cells searched and began threatening and cursing the officers. A video, recorded with a cellular phone by an inmate, was later uploaded to social media showing prison officers - some masked - beating and kicking prisoners who were later secured with tie-straps. Prison sources said that video only showed one aspect of the incident and the person recording, did not upload images of faeces being thrown at prison officers. Yesterday, Prisons Commissioner Gerald Wilson confirmed discovery of the illegal items in the locker. “During a search on Tuesday of the Port of Spain prison, sniffer dogs were used as officers searched dormitories belonging to prison officers. A dog stood by one of the lockers as a sign that it had sniffed out something. When that locker was searched, marijuana in fruta fruit juice cartons as well as cigarettes and other items were found,” Wilson said. He added that investigations are continuing and that the prison officer who is assigned to this locker, has been off duty on sick leave. “I am disheartened by this discovery because despite our best efforts to ensure that officers are scanned, there are still those rogue elements who indulge in criminal activities. “There are scanners and still this happens. I think there are lapses in security which have to be reviewed. I don’t want to speculate if the items found were for sale to prisoners. I will be trying to come up with new strategies to ensure the smuggling of contraband items is stamped out,” the commissioner said. Yesterday, police sources said that the prison officer who was assigned the locker is yet to be interviewed by investigators as certain standard procedures first have to take place. Investigations are continuing into both the ganja find and also the beating of prisoners by prison officers. Reply to "Ganja in juice packs"